There once in India a very smart cat who, to catch mice without too much effort, pretended to be a sage in meditation. The cat then - imitating the great Rishis of Hinduism - was standing on one leg with its own legs raised and the 'hands' clasped. The cat was named Rudraksha, because he had also the traditional Hindu rosary, the japamala which consists of rudraksha seeds, the tears of Shiva. The news spread quickly and everyone, men and animals, went to pay homage to the 'holy'. Even the rats, won their initial fear, they went to worship the cat. But after a while time, the mice began to realize that their number decreased as the cat gained weight more. Discovered the trick, the cat Rudraksha had to emigrate and went to deceive other mice in other places. Of this story we also have the narrative in a beautiful sculpture. 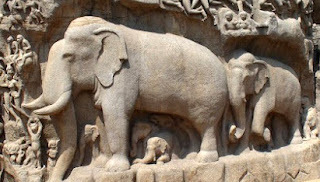 In fact in Mammalipuram (or Mahabalipuram) near Chennai on the southeastern coast of India in the wonderful bas-relief about the birth of the river Ganges, we can see Rudraksha, the cat in meditation. In India cats are considered unreliable and hypocritical so that the Manusmriti (Laws of Manu) suggests wise man "not to offer even a bit of water to the one who acts like a cat," and then explains that "who is covetous, displays the flag of virtue, treacherous, hypocritical and swindler, he acts like a cat "(Manusmriti IV, 192).